Love That Max : Isn't this what we all want for our children? Last week I got this photo of Max sitting at a potter's wheel, in camp. I stared and stared at it, happy to see him so happy and excited to see him using his hands that way. Max skipped the extended school year this summer in favor of a string of camps. Part of me worried about him missing out on classes. Yet I wanted him to enjoy camp, something you can only do when you're young. By all reports, Max was having a whole lot of fun. But just as thrilling, and skipping-school-affirming, was to see him doing an activity that's new to him. Away from us, I think he's more open to giving different things a go. Sabrina's the same, gung-ho to do new water sports at her camp and try her hand at crafts. We want our kids to thrive in school, of courseofcourseofcourse. But I get so revved when mine have the chance to explore without being accountable—no expected outcome, no deadlines, just a chance to open their minds and expand their horizons. To me, camp is just as much of a learning experience as sitting in a classroom. Which is all to say: camp rocks; we're grateful to the programs that exist for Max because even though there should be a ton, relatively few camps are open to kids who need help with life skills; and as psyched as I am for Max to start high school (HIGH SCHOOL! ), I'm refusing to think about the start of the school year. He's doing great! I'd love to see any finished pieces he creates. 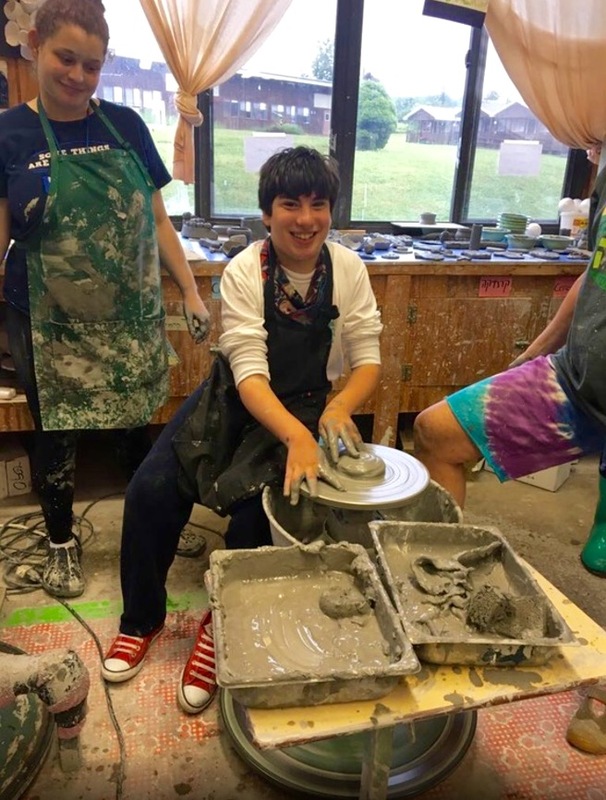 The pottery wheel is challenging especially when one struggles with coordination and upper body strength. Max's smile says he's having a blast and that's wonderful. The life skills that you learn in sleepaway camp are invaluable and will serve Max for his entire life. Think of all the social skills and independence that a kid uses every day in order to thrive when he is in a totally new environment away from home! And by the way, I think it is very clever of Max to realize that wearing the fire hat gives him a unique identity and a conversation piece in an environment full of new kids and adults. Go Max!!! Have fun at camp!! I've followed your blog for a long time and I just love this picture of Max. He looks so handsome and happy and his willingness to embrace something new is inspiring.